Howdy everyone! Are you Sick of taking non direct bus service between Kuala Lumpur and Bandar Penawar, and between Kuala Lumpur and Sungai Rengit? Now LA Holidays Express has offered their direct bus and non stop service between Kuala Lumpur, Bandar Penawar and Sungai Rengit. Don’t wait any longer and book LA Holidays Express bus tickets online in advance at BusOnlineTicket.com now! 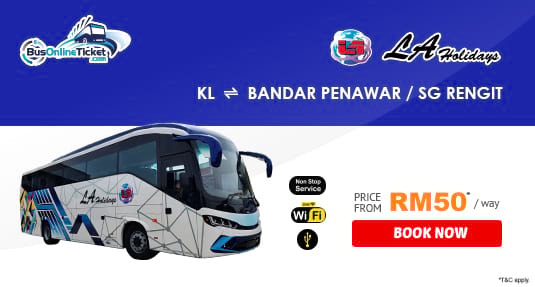 Though LA Holidays Express is a relatively young express bus company with its headquarter based in Kuala Lumpur, they have emerged as one of the top managed express bus in Malaysia. Besides its own brand of express bus service, LA Holidays is also the partner of KKKL managing the routes of Kuala Lumpur to Singapore, Kuala Lumpur to Johor, Genting Highlands to Singapore and Genting Highlands to Johor. With their track record of excellent service, passengers are comfortable in taking LA Holidays bus services to their destinations. Please note that all buses are VIP buses equipped with WiFi and USB power point. These bus services mentioned above are important for the locals especially working adults and students who travel back and forth between these three locations. In addition, Bandar Penawar also serve as the gateway to Desaru Beach, an ideal place for a short weekend getaway with your family and friends. Booking LA Holidays Express bus tickets online via BusOnlineTicket.com can help you to secure your seat before you go for a trip. Due to the limited schedule and seats available for these bus services, you are strongly encouraged to book your bus ticket online in advance. Instant booking confirmation will be sent to your email upon a successful payment.